The story of The Midnight Sanctuary follows Hamomoru Tachibana. Hamomoru, a devout Christian woman, has come to help find out about the history of the Christian village known as Daiusu Village. The heads of the village want to help modernise the town, and as such bring tourism to their corner of the world. In the beginning, the village seems like a friendly place to visit, but as you progress, a dark shameful history lurks in the towns past. Things become even more complicated when the Saint arrives, a woman whom the villagers worship. But is this Saint helping the dead villagers move on to heaven like they claim, or is something more sinister happening in Daiusu? 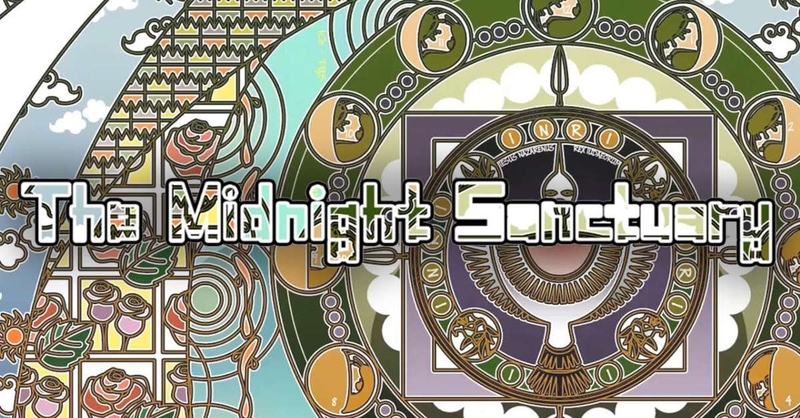 The Midnight Sanctuary is a visual novel, and as such the story needs to deliver more so than other games that can fall back on their gameplay. Unfortunately, this tale isn’t good enough to carry this game. This game is billed as an occult horror visual novel, though the term horror is used rather fast and loose here. There was nothing truly horrifying about the story, no sense of dread, suspense or fear. Mix in the fact that the ending does not deliver a satisfying conclusion to the story, and The Midnight Sanctuary comes across as a big disappointment. Being a visual novel, the game has little in terms of game inputs. Surprisingly, the game drops the ball with the button layout. Traditionally, games use the A button to select things in menus, while B cancels or goes back. Here the buttons are reversed, meaning clicking through text speeches requires you to press the B button. This took a lot of getting used to, and there is no way to change the button layout. Unlike most visual novels, The Midnight Sanctuary requires little to no player input. The main draw of a visual novel is the fact that there will be sections within a story that the player makes choices, helping to shape and drive the story forward. You will make no such decisions in this game. You literally just press B to cycle through text, then occasionally choose where to visit in town. Considering you have to go to every available place in town that is presented to you eventually, choosing the order you do them seems like a pointless task the game lets you do to try and trick you into thinking you are playing a game, rather than just watching and reading. Because The Midnight Sanctuary takes player choice out of the visual novel formula, it makes this game a one and done affair. There is no replay value here whatsoever, and with the game clocking in between three to four hours, the game really is light on content. The visuals here leave a lot to be desired. A very basic 3D art style is used for most of the main characters, which seems fine in the beginning, but you will quickly notice that they have extremely long arms and fingers, which I found distractingly horrific. Maybe that is what they mean when they say this game is a horror? There is a static image that is used in the background of the whole game, with certain elements in the foreground cutting through the environment to reveal the static image behind. This means when those elements move, the pattern itself doesn’t. This became very distracting for me and forced me to take many breaks as this art style choice strained my eyes quite significantly. Character movement is extremely awkward as well. One character seems to look drunk all the time when she isn’t, and anytime a character moves at all, it comes across as very amateurish. I’m unsure whether this was an artistic choice or not, but I felt this aspect didn’t do the game any favours. The audio is very hit and miss. Music can be rather beautifully done but will cut out at a moment’s notice, creating a rather jarring experience. The sound effects also range between serviceable and very annoying. There is a walking sound that is used for footsteps on occasion which sounds like a dying frog. The one saving grace of the audio is the voice acting, which is tremendous. Each character is voiced at an elite level, even the side characters. Be aware though that the VO is completely in Japanese. The Midnight Sanctuary unfortunately, misses the mark on most of what it sets out to achieve. As a visual novel, it is a step back from most other titles in the genre. As a story, it fails to deliver a satisfying conclusion. As an artistic game, its art style and sound design are rather lacklustre, leaving a lot to be desired. The voice acting is stellar but is just not enough to carry this one. Clocking in at just over 3 hours with no replay value also diminishes the overall package somewhat. Overall I find it hard to recommend this game, even to diehard fans of visual novels.